The Occupational Safety & Health Administration (OSHA) recently announced an important update to the rules and guidelines dealing with electric power generation – changes that have been in the works for the past 9 years! Enhancements to electrical protective equipment standards are projected to avoid about 120 serious injuries and 20 fatalities per year. The rule changes will also save construction and electrical companies, contractors and agents millions of dollars per year in safety and operating expenses. Any worker involved with power generation, transmission, and distribution lines and related equipment operation & maintenance must follow the general industry standard, 29 CFR 1910.269. But for construction work on the same components (not operation & maintenance), the construction standard applies (29 CFR 1926, Subpart V). •Qualified workers must have training to recognize and control or avoid electrical hazards at the worksite. •Host and contract employers must share information on safety-related matters and must coordinate work rules and procedures. •Employers must assess worksites to identify workers exposed to flame or electric arc hazards. The changes are effective July 1, 2014. For more information, read the entire article here. This article is just one reason to give CertifyMeOnline.net a call. OSHA guidelines are constantly being tweaked and changed. Instead of worrying about this rule and that demand, let us do all the work for you. 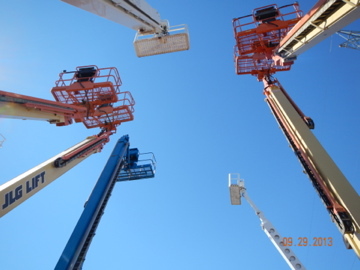 CMO has OSHA-compliant aerial lift, scissor lift and other training courses that fit your schedule and budget. We’re the online leader in training course. Best of all, you’ll enjoy 24/7/365 access. If you’re online, our content is available to you! Coca-Cola, Harley-Davidson, Siemens, Verizon and Fuji Film are some of the companies that trust CMO for all their training needs. Give us a ring at (602) 277-0615 for more information, or visit our contact page to ask a question, request a quote and more. CertifyMeOnline.net looks forward to helping you become OSHA compliant. Thanks for reading our blog, and make sure to check out our other articles!